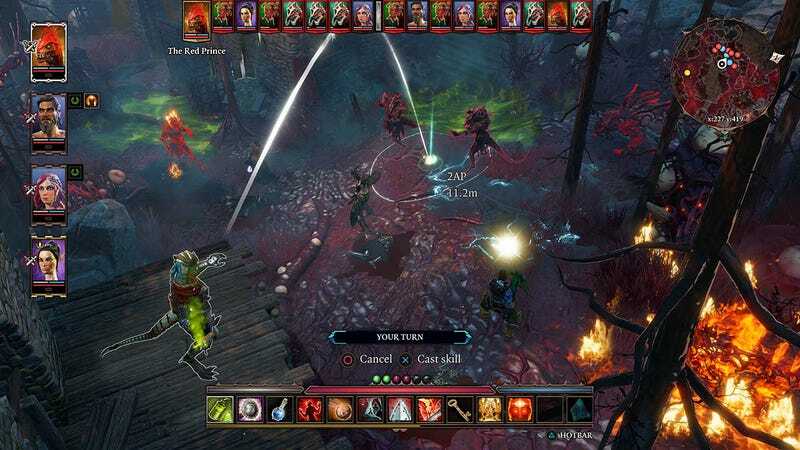 The console port of Divinity: Original Sin 2, one of the greatest role-playing games ever made, is just about the best the developers could’ve done. It’s a solid port. It’s just not quite as perfect as the PC version. Tomorrow, Larian Studios will release the “Definitive Edition” of Divinity: Original Sin 2. PC players will receive a free update that includes an overwhelming list of changes (seriously, look at them all). The game will also be available on PlayStation 4 and Xbox One for the first time, allowing a whole new audience to play my favorite RPG of the modern era. It all works nicely, but it also adds a layer of extra clunkiness that just isn’t there when you’re playing with a mouse and keyboard. For example, on PC you can access your abilities with a single click or numerical key. On a PS4 controller, you need to press triangle, then manually navigate to whichever ability you want to use. Also, Divinity: Original Sin 2 is a game full of elaborate graphical effects (as Kirk showcased earlier this year). Just walking around the first area, the Fort Joy Ghetto, is enough to get the game’s frame rate dropping on PS4, and when you start introducing fire, things can get hairy. So here’s my advice: Play Divinity: Original Sin 2. No matter what. If you can, play it on PC, but if you have to settle for the console version, I think you’re still going to have a damn good time.